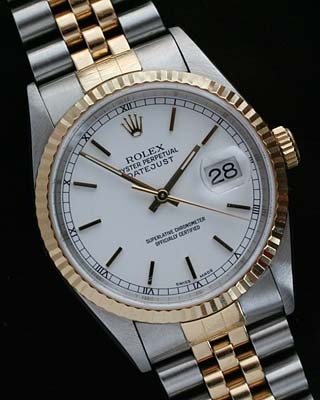 Used Rolex Datejust with solid 18 karat gold bezel and 2 tone jubilee bracelet. 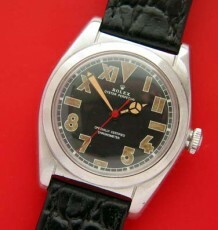 The watch dates to 1997 and comes with recent Rolex service papers showing the watch was factory serviced in 2006. A stunning and super clean pre-owned Rolex. This Used Rolex Datejust dates to 1997 based on the serial number and comes with the original box and recent Rolex service papers. 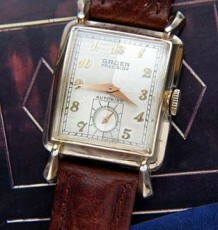 The watch features a clean white dial with gold stick markers along with gold hands. The effect is striking and very readable while being extremely elegant. The watch is fitted with the famed Rolex calibre 3135 perpetual automatic movement, which was cleaned and serviced when the watch was sent into Rolex for a complete service in 2006. The accompanying paperwork shows the cost of this service to be $661. 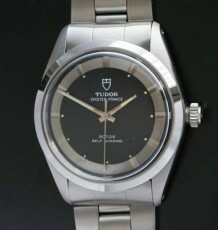 The 2 tone or Rolessor steel and gold Jubilee bracelet is as tight as it was when new and will fit up a 7.75 inch wrist. The watch will be sold with the original Rolex green box, receipt for service and the Rolex service warranty papers which has since expired. 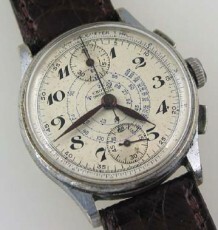 The watch measures 36 mm wide and is in near mint condition.